Jeff's Bike Blog: How fast is fat? 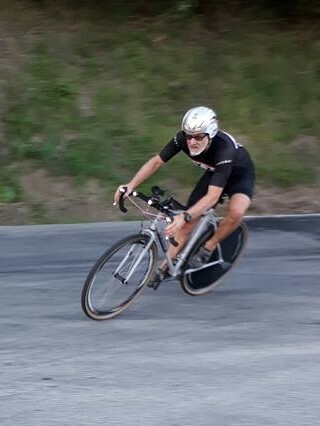 There is a lot of loose talk of how fat tires are fast and lower pressure is better, so I thought I would do an experiment, over two weeks of Time Trials with the local Masters Club, on the course I have probably ridden on more than anyone else to date. 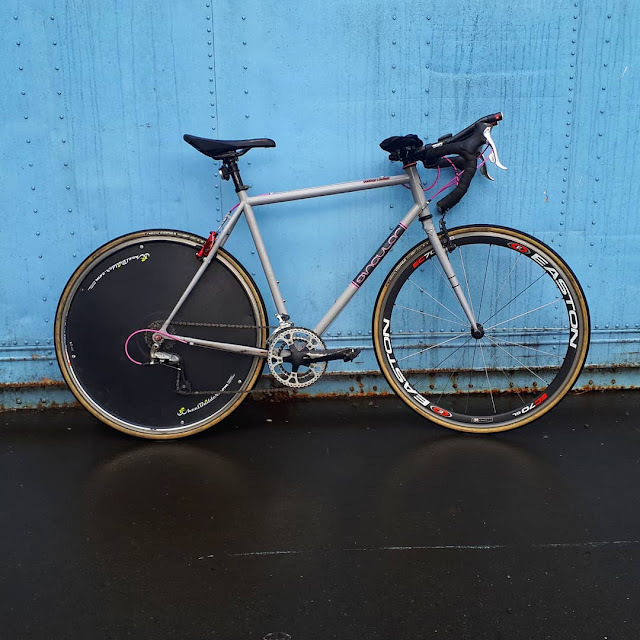 I have a couple of sets of "fatter" tires, and my experience when riding in a bunch is that I have to work a lot harder to keep up than on my skinnier treads. This is the same course I did the Karate Monkey World record on, cranking out over 41kmh on a steel MTB in 2015. It was running rear disc covers and tri-spoke on the front, so that tells me tires and wheels do make a bit of difference. 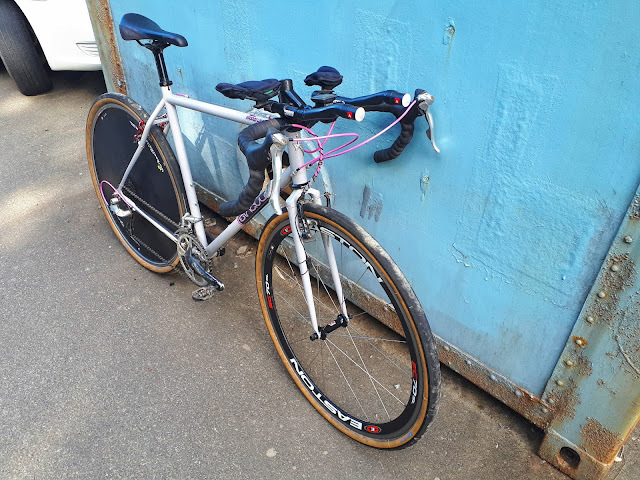 Having sold the Karate Monkey, the next most suitable bike I had left was my Singular Kite Cyclocross bike. It is probably a bit lighter than my Karate Monkey, but I suspect not as aero. What I was looking for was a difference in speed between my two sets of tires, the 38mm Compass Barlow Pass and the 25mm Vittoria Corsa G+ Graphene. Thats quite a jump in size I know, but it also means it should be big enough to measure given my "seat-of-the-pants" testing methodology. Photo by Orca Whale. Fat tires corner well. The Liverton Road time trial course is what the English Time Trialists would likely call a "Sportsmans Course". It has undulations and patches of rough seal and the odd pothole on one side, and mostly smooth seal on the other. It has two very tight corners, one at each end of the 4 x 6km laps. By tight I mean that if you were on the edge you might be lucky to get through them at 30kmh at best. My plan was to compare from week to week, and use the times of the riders around me to create a control to cover any variables in conditions. Event 1. 38mm Compass Barlow Pass tires on Singular Kite. A typically crappy day for Time Trialling in Wellington, a northerly with buffeting from the side gullies that joined onto the course. The bike felt slow everywhere except when powering over the rough surfaces outside the quarry entrances. (Link for LOTR fans).Usually you get jarred to pieces in these segments on a typical TT rig. With the Barlow Passes, I just floated over the top with no scary surprises. Actually, I was also fast on the corners, I was able to lean over pretty aggressively without feeling scared. As I suspected, with my current (lack of ) form, I averaged exactly 37 kmh. This lined up with my gut feeling from mixing it up with riders with normally shod wheels. I hadn't ridden for 5 weeks over xmas, then got sick when I came back to work so I was not really expecting too much in the way of fitness. I delivered ! Singular Kite with 38mm Compass Barlow Pass tires. Event 2. 25mm Vittoria Corsa G+ Graphene on Singular Kite. This one didn't start well at all. I turned up at the course to find out that the TT had been cancelled 30 minutes earlier via Facebook ! I was gutted. Bugger it. I decided to do it anyway, I would have to be extra careful as there was no warning signage or marshalls to alert drivers. Pretty much as soon as I started the wind changed, a southerly squall blew in, soaking me but it was nice at the top of the course, going a good 10kmh faster than I was the week before in the northerly conditions. On the whole the conditions weren't bad. Pretty even, but I wasn't really able to lift my top speed above 43 kmh for very long at all. I have to say that the Kite does not feel very aero at all. So, not officially a race really, I didn't have prologue lungs after the ride, so I am guessing that without other riders on the course I wasn't quite able to get exactly 100% from myself, I must have been pretty close though. The wetter conditions would have cost me time on the corners, especially without marshalls at hand and on the narrow less confidence inspiring tires. On the other hand, I rode an hour earlier than normal, so I would have benefited from more draft from passing traffic, and my gut feeling is that wet courses are faster than dry ones. I think by and large things would have evened out overall. So, I managed exactly 39 kmh, 2 kmh faster than on the fatter tires the week before. I know these speeds are nothing to write home about, but that's not the point, the point is the difference. If you are happy to be riding 2 kmh slower than your buddy for the same power on the smooth stuff, then there could be room on your bike for a tire like the Barlow Pass. It excels on gravel, giving a really comfy ride should you decide to take the long way home. Sometimes its good to have that option. I really like the Vittorias as a road tire, but I wouldn't be taking them off road in a hurry. The 28mm versions might be acceptable for a few patches of gravel here and there. I rode the Barlow Passes at 48psi and the Vittorias at 85psi. The Barlow Passes were the regular versions, not the light-weight ones.